Calvin Coolidge Ermer was born on November 10, 1923, the youngest of seven children of John and Mamie (Speam) Ermer in Baltimore, Maryland. “My dad was a red-hot Republican,” Cal said, explaining his given names. “[H]e named two of my brothers after [Presidents] Hayes and Harding.”3 John Ermer was a coal salesman who raised his family on Eaton Street in the omnipresent rowhouses of East Baltimore, less than three miles east of present-day Oriole Park at Camden Yards. The crowded streets and few open lots in the neighborhood offered few opportunities for organized sports, and Cal did not play baseball until prep school. Ermer attended Patterson High School in Baltimore where his athletic gifts caught the attention of coach and physical education teacher Joe Fisher. They combined to lead the Patterson High Clippers to the Maryland Scholastic Association baseball championship in 1940, and the baseball and soccer championships in 1941. Fisher detected in Ermer a maturity beyond that of his other students, and he often turned to his star athlete to help run the teams, experience that served the young man well for the rest of his life. But it was the immediate future that Washington Senators scout Joe Cambria had in mind when he discovered Ermer on the Baltimore sandlots. In 1941 or 1942, shortly after Ermer graduated from high school, Cambria signed the youngster to a $85 amonth contract to play ball in the Senators farm system. Ermer spent most of the 1942 season at second base for the Burlington (North Carolina) Bees in the Bi-State League (Class-D). Generally, a light-hitting, slick-fielding infielder, on August 25 he provided the bulk of his team’s offense with two home runs in a 5-3 win against the Rocky Mount Rocks. With World War II raging, Ermer had little opportunity to build upon this debut season. Along with thousands of young patriots, he enlisted in US Marine Corps. Initially stationed at Parris Island, South Carolina, in 1943, he played second base for a military team that, with a roster of professional ballplayers (including former major league right-hander Boots Poffenberger)that went 51-11. Transferred to Quantico a year later, the able 21-year-old was selected as the manager of the base team. Erroneously listed as a 21-year-old, Ermer was heralded as the youngest skipper in both circuit history and all professional baseball in 1947—a claim likely true despite his true age of 23. (Professional athletes commonly shaved a year or two off their age to prolong their careers; Ermer appears to have maintained the two-year discrepancy throughout his playing days). On June 24, his first day on the job, Ermer led his charges to an 11-2 blowout victory. Griffith promptly removed the interim label from his player-manager in an emerging “plot for a Horacio Algers story.” Playing their home games in spacious Griffith Park, the All Star second baseman tied for the club lead with seven home runs while performing flawlessly in the field. “[H]e had no fielding peer in the league” said The Sporting News contributor Furman Bisher.5 Ermer guided the Hornets out of the cellar to finish in fourth place in the eight-team circuit. On September 2, the last day of the regular season, he collected three hits to lead his club to a 6-5 win over the Rock Hill Chiefs on “Cal Ermer Night.” The Horacio Alger story reached its climax when the young skipper led his team to the league’s Shaughnessy Playoff championship. Selected among the Senators late-season call-ups, on September 26, 1947 Ermer made his major-league debut at second base in Washington’s Griffith Stadium in the second game of a doubleheader against the Philadelphia Athletics. In his first at-bat against right-hander Bill McCahan he reached base on an error by third baseman Mickey Rutner and after advancing to second on a passed ball was stranded there. Ermer grounded into a double-play in the fourth and a fielder’s choice in the seventh to finish the day 0-for-3. Though it could’ve hardly been suspected at the time, Ermer had played in his first and last major league game that day. This hardly seemed the case when, during the offseason, Griffith tabbed Ermer as one of the franchise’s top prospects. Confident the youngster could make the jump from Class-B to the majors, Griffith hired veteran hurler Joe Bowman to replace Ermer as manager of the Hornets and sold starting second baseman Jerry Priddy to the St. Louis Browns. But Griffith, in what proved to be a prescient move, acquired Boston Red Sox rookie second baseman Al Kozar as insurance two days after Priddy’s departure. Ermer was given every opportunity to win the Senators second base job, but two weeks before the start of the season he was optioned to Charlotte and appointed the Hornets team captain. A fractured thumb that sidelined him for three weeks and plagued his hitting when he played marred Ermer’s return. Around midseason the second-sacker was laterally transferred close to home to the Hagerstown (Maryland) Owls in the Interstate League where he was briefly reunited with former Parris Island teammate Boots Poffenberger. Ermer regained his stroke—.284 in 334 at-bats—while manning third base for the Detroit Tigers affiliate. Ermer appears to have requested the move to Hagerstown as he prepared for his first of many fall seasons as the coach of the University of Baltimore soccer team. The job was offered to him by former major league infielder Frank Skaff who made inroads with the university while playing in Baltimore in 1944-45 (one reports suggests he served for a period as the school’s athletic director). It is unclear how the two first became acquainted—presumably through sporting events in Baltimore—but the partnership benefitted the university as it collected five Mason-Dixon College Conference championships under Ermer’s direction. The partnership continued in 1949 after Ermer secured permission from the Senators to play for the Skaff-led Savannah Indians in the South Atlantic League (an Athletics Class-A affiliate). Back at his familiar second base position, Ermer collected career high marks in hits (141), homers (9) and total bases (208) to earn a spot on the circuit’s All Star squad. In September, he was called up by the Senators but did not play. In 1950, Ermer returned to the Nats fold and, at the urging of Skaff and Griffith, accepted the role of player-manager for the Orlando Senators in the Florida State League (Class-D). Positioning himself at third base, Ermer collected All Star honors while leading his team to its last pennant in club history. He repeated the feat a year later by leading the Charlotte Hornets to 100 wins and its last pennant in the Tri-State League (Class-B). In 1952, Ermer, by now the “wonder boy [of] the Washington farm system,”6 pulled off the hat trick by leading the franchise’s highest minor league affiliate, the Class-AA Chattanooga Lookouts, to its first pennant in 13 years. The youngest manager in Southern Association history, Ermer instantly recognized the talented athletes surrounding him and removed himself from the active list; he never played again. He treated his players fairly and garnered respect from every corner with his 24-hour-a-day approach to the job. “[Ermer] makes you want to win,” said one veteran. “He . . . has a word of encouragement all the time and keeps the players in the right frame of mind.”7 The franchise’s coffers benefitted from a club record 252,703 attendance during the season. Though the Lookouts were ousted in the first round of the playoffs, Ermer’s name began to surface as a future replacement for Senators skipper Bucky Harris. In October, Ermer announced his engagement to Chattanooga resident Gloria Ruthe Williams. Eight years his junior, the auburn-haired beauty was born in Michigan but grew up in Chattanooga. In 1952 she travelled to Atlantic City, New Jersey, as Tennessee’s representative in the Miss America beauty pageant. She had two aunts who worked for the Lookouts—one the secretary to club president Joe Engel, the other the ballpark’s concessions manager—and on occasions Gloria worked there as well. The couple initially met during a promotion at the stadium. They married on February 21, 1953, and the union would produce two sons. Chattanooga became Ermer’s permanent residence and, except for winter ball in Latin America, he had the rare privilege of working from home over the next five years. Resourceful and inventive in encouraging his players, Ermer was certainly no wallflower when it came to disciplining his charges. When Roy Hawes failed to run out an infield fly during a July 12, 1953, game against the Little Rock Travelers, the Lookouts first baseman was fined before he got back to the dugout. Later in the same game Ermer’s negotiating skills were also put to the test after both his catchers were ejected arguing balls and strikes. Having no one else to man the position, the astute skipper talked the umpire into ejecting himself from the game so that catcher Hank DiJohnson could remain. More often, Ermer’s relationship with the men in blue was far less cordial as evidenced by the many fines he paid and suspensions he served throughout his long career—including ejections and undisclosed fines assessed following on-field fist fights with Atlanta Crackers manager Whit Wyatt and Memphis Chickasaws pitcher Lowe Wren in 1954 and 1956, respectively. Ermer’s managerial duties took a bizarre turn when he was called into court to testify on behalf of Lyle Luttrell after the Lookouts shortstop filed an unprecedented lawsuit against Nashville Volunteers catcher Earl Averill over injuries sustained following an August 1955 on-field altercation. Though Ermer signed on as the manager of the Lookouts in 1957 for a league record sixth consecutive season, his long tenure in the Senators organization was soon interrupted. In May, following a dreadful 4-16 start, the Senator’s coach Cookie Lavagetto replaced skipper Dressen. Apparently Ermer wasn’t even considered. Six months later, following a lengthy hard-fought four-team pennant race, the Lookouts skipper jumped to the manager’s job with the Birmingham Barons in the same circuit. In 1958, Ermer led the Barons to its first pennant in 27 years before guiding the Tigers Double-A affiliate to the Junior World Series championship. “This club never let down,” Ermer proudly exclaimed. “When they ran into trouble, they bounced back like real champions. They seemed to thrive on adversity, which is the sign of a real championship outfit.”10 In December, The Sporting News selected him as the 1958 Minor League Manager of the Year. Over the next three years Ermer moved a step closer to the major leagues with managerial stints with two clubs in the AAA International League. Though he won no pennants, he helped guide the careers of many future major league players including All Stars Gene Alley, Julian Javier, Tom Tresh and Bob Veale. In 1960, as the Senators tumbled to a record of 9-17 in May, Ermer’s name surfaced as a possible replacement for Lavagetto before the club chose to retain the former third baseman. Throughout his three-year tenure in the International League, l Ermer never lacked for resourcefulness while leading his teams. A telling example occurred in 1961 when he was managing the Richmond Virginians. On May 31, a thick fog rolled in during the eighth inning of a game against the Jersey City Jerseys. The umpires granted Ermer permission to halt the game and hit fungoes to the outfield to prove that his players could not see the ball. Unconvinced, the umpires continued the game. Richmond hurler Hal Reniff, promptly walked two batters, the second a bases-loaded pass that proved to be the winning run in a 2-1 loss for the Virginians. During the 1961-62 offseason Ermer was one of the frontrunners named to fill the Baltimore Orioles managerial vacancy before the club selected former major league infielder Billy Hitchcock. Having worked together in the Tigers organization in 1958, the two men were well acquainted, and Ermer quickly joined Hitchcock’s staff as the team’s third base coach. But 1962 proved to be a disappointing year for the Orioles. At the end of the season, in a move that The Sporting News contributor Doug Brown described as “little more than scapegoat[ing],” the club fired Ermer and fellow coach George Staller. Both were retained as scouts while Ermer also served the organization as a roving minor league instructor. In 1965, he was hired by Calvin Griffith, the general manager-owner of the relocated Minnesota Twins and son of Ermer’s former employer Clark Griffith, Calvin’s uncle. Taking over the reins of the Denver Bears in the Pacific Coast League, Ermer led the offensively-charged team to a .555 winning percentage over two seasons. (Pitching was another matter—in May 1966 Ermer was forced to activate his 43-year-old coach Art Fowler after injuries and ineffectiveness crippled the staff.) At some point during this two-year period Griffith made a personal pledge to Ermer that, when the need arose, he would be selected as the next Twins manager. The Twins entered the 1967 season under the helm of manager Sam Mele who had replaced Lavagetto six years earlier (there is no evidence that Ermer, who had bolted the organization three years before, was ever considered for the job). In 1965, Mele led the club to its first World Series appearance in three decades with a franchise record 102 wins—a level of success that spawned even greater expectations for the future. But in 1966 a late surge could not overcome the club’s mediocre first half as the Twins finished a distant nine games behind the first-place Orioles. A similarly sluggish start 50 games into the 1967 season brought an end to Mele’s tenure. After more than 15 years managing in the minors, Ermer finally got the call to the big leagues. His familiarity with a large percentage of the Twins players who had played for him coming up made the transition easy. On June 9, Ermer made his major league managerial debut in Minnesota against the Orioles. In the first inning Baltimore capitalized on a two-out error by Twins’ ace Dean Chance to take a 3-0 lead in an eventual lopsided 11-2 win—ironically the identical score by which Ermer won his first minor league game 20 years earlier. The next day, Ermer collected his first win with an 8-1 victory over the Orioles. Over the next two weeks the Twins continued at a near .500 pace before launching a season-best eight game winning streak. A seven-game streak in August pushed the club into first place, prompting a joyous Griffith to tear up Ermer’s contract for a pact running through the 1968 season. Throughout the last seven weeks of the season the Twins jockeyed with three teams for first place in a nail-biting pennant race that included a September 6 four-way tie. On September 30, the first-place Twins opened a season-ending two-game series in Boston with a one-game lead over the Red Sox and Tigers. The Twins chances to clinch the pennant looked good with Kaat, who had won his last seven decisions, on the mound. But after a third inning injury forced the lefty from the game, the Red Sox rallied against three relievers for a 6-4 win. The next day, Twins ace Dean Chance carried a 2-0 lead into the sixth inning before a bases-loaded single by future Hall of Fame slugger Carl Yastrzemski ignited a five-run rally to send the Red Sox to the World Series. When the heartbroken Twins returned home Ermer promised a welcoming crowd that he would deliver a pennant in 1968. Unlike in years past when he guided several Latin American clubs in the winter circuits,12 Ermer spent the offseason monitoring the progress of Twins players in the Florida Instructional League and Puerto Rico. One FIL experiment included the failed attempt to move future Hall of Fame inductee Rod Carew from second to third base. Between potential moves and offseason trades the Twins entered their 1968 spring camp with only three positions locked down—catcher, first base, and right field. The fluid situation, combined with of series of injuries throughout the season—the worst being a hamstring injury that limited Killebrew to a mere 295 at-bats—contributed to a league-worst 170 errors for the faltering team. As the losses continued, Ermer’s job got even more messy when his players began publicly complaining about their playing time and on-field employment. Different signals being sent from Griffith only ratcheted up the pressure. He blasted Ermer for benching of Carew for two games in early July after the second baseman arrived late to the park and declined to participate in pregame drills; two weeks later the meddling owner was grousing that his manager was not enough of a disciplinarian. The Twins ended the campaign in seventh place with a disappointing record of 79-83. One day after the season finale Ermer was fired. Within days of his dismissal Ermer was rumored to take the helm of the New York Yankees, replacing manager Ralph Houk who was reportedly at odds with the club’s brass. In November, yet another rumor had Ermer joining his former minor league student and then-Washington Senators skipper Jim Lemon before the club’s new owner replaced Lemon with Hall of Famer Ted Williams. 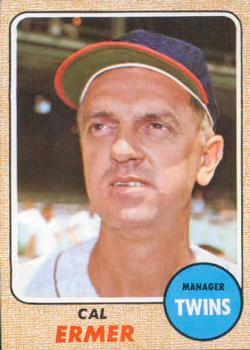 Ermer instead spent 1969 scouting for the Twins. In 1970-71, he joined the Milwaukee Brewers as the club’s third base coach and briefly piloted the team when manager Dave Bristol sat out a six-day suspension following an August 17, 1971 dustup with the umpires. Ermer spent the next year scouting for the Brewers. Except for a coaching stint with the Oakland Athletics in 1977, Ermer spent the remainder of his career managing the Twins Triple-A affiliates in Tacoma, Washington (1974-76), and Toledo, Ohio (1978-84). During this time, he helped usher many notable careers including future Cy Young Award winner Frank Viola and Hall of Fame outfielder Kirby Puckett. At various times Ermer’s name was bruited about as a prospective manager when major league baseball expanded in 1977, when the Twins explored potential vacancies in 1974, 1976 and 1980, and when the Seattle Mariners considered replacing interim manager Chuck Cottier after the 1984 season but nothing came of these. When Ermer retired as manager of the Toledo Mud Hens after the 1984 season, he held the record for most career wins (469) for a Toledo skipper while also shattering the 82-year-old record for most years as manager (both records have subsequently been broken by Larry Parrish). Through 2016, he ranks 18th all-time with 1,906 career minor league wins. In 1985, Ermer launched a long career as a scout for the Twins. His most notable signing was two-time All Star outfielder Matt Lawton. In 1988, Ermer gave pointers D. B. Sweeney as the Hollywood actor prepared for his role as Shoeless Joe Jackson in the 1989 release of Field of Dreams.13 In 2008, Ermer’s career as a collegiate soccer coach was recognized with his induction into the University of Baltimore Athletic Hall of Fame. On August 30 that year, the Chattanooga Lookouts dedicated the AT&T Field press box to Ermer. Two years later he joined longtime Dodgers skipper Tom Lasorda as the first players inducted into the field’s Hall of Fame. In addition to the sources cited in the Notes, the author consulted Ancestry.com and Baseball-Reference.com. The author wishes to thank Rod Nelson, chair of the SABR Scouts Committee for his valuable assistance. Further thanks are extended to Tom Schott for review and edit of the narrative. 1 “A Tough School for Leaders,” The Sporting News, July 1, 1967: 14. 2 “Cal’s Curvers Will Earn Pay With Double Duty,” ibid., July 1, 1967: 11. 3 “Humphrey Visits Nixon—Russ of Twins, That Is!” ibid., August 19, 1967: 20. 4 “Twins Applaud Ermer Pick as Pilot,” ibid., June 24, 1967: 7. 5 “An Alger Tale: Hornets’ Pilot Gets Nat Test,” ibid.,March 10, 1948: 23. 6 “The P.T. Barnum of the Bushes,” ibid., November 12, 1952: 14. 7 “Youthful Cal Put ‘Nooga in Flag Fight,” ibid., August 20, 1952: 33. 8 “’No Comment,’ Says Griff of Bucky Bounce,” ibid., July 21, 1954: 19. 9 “Surging Lookouts End Atlanta Jinx,” ibid., June 8, 1955: 43; Doug Wilson, “Chemistry 101: Why an Extremely Talented Twins Team Failed to Win the 1967 Pennant,” August 30, 2015. Accessed November 6, 2016 (http://bit.ly/2fu4oTV). 10 “Barons’ Pennant Hailed by Ermer as ‘Team’ Effort,” The Sporting News, September 10, 1958: 35. 11 Daniel R. Levitt, “A Surprising Disappointment: The Minnesota Twins of the Late 1960s,” The National Pastime: Short but Wondrous Summers, SABR, 2012.. Accessed November 21, 2016. (http://bit.ly/2g9Zpfg). 12 In 1963-64, Ermer helped future Hall of Fame righty Phil Niekro develop a knuckleball while both served in Puerto Rico. Eight years later he offered the same help to Phil’s brother Joe. 13 David Krell, “The Black Sox: Fact vs. Fiction,” The Sports Post, July 13, 2015. Accessed November 6, 2016 (http://bit.ly/2ertbay). 14 Bill Schenley, “Cal Ermer, 85: Was MLB Player (One Game) & Manager (Minnesota Twins),” Google Group alt.obituaries post, August 9, 2009. accessed November 6, 2016 (http://bit.ly/2fQaToA).